Every → successful innovator knows this: Innovation is actually a very simple phenomenon. 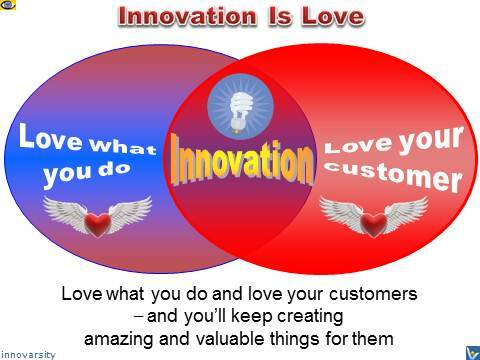 Innovation is about Love: do what you love to do, and love your customers. Get involved in a variety of activities to find eventually your true passion. Experiment, investigate various jobs and interests until you find something you love to do. This is a key factor in creating something that not only makes you money but also brings you joy! If you love your work and strive to make your customers – your loved ones – as happy as possible, you’ll be creating wonderful things for them – continually and passionately. If you love what you do, there are no difficult tasks, only interesting ones. 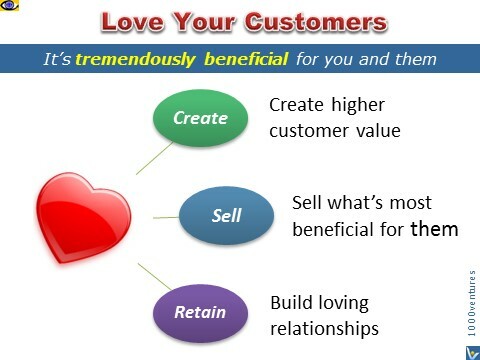 If you do love your customers and do strive to make their life happier, more fulfilling, comfortable and joyful, you’ll invent wonderful things for them. You’ll become a relentless value innovator and keep creating new great things your customers will love. look for the quantum leap. It is often easier to make progress on mega-ambitious dreams since you have little competition. New opportunities for innovation open up when you start the creative problem-solving process with empathy toward your target audience.